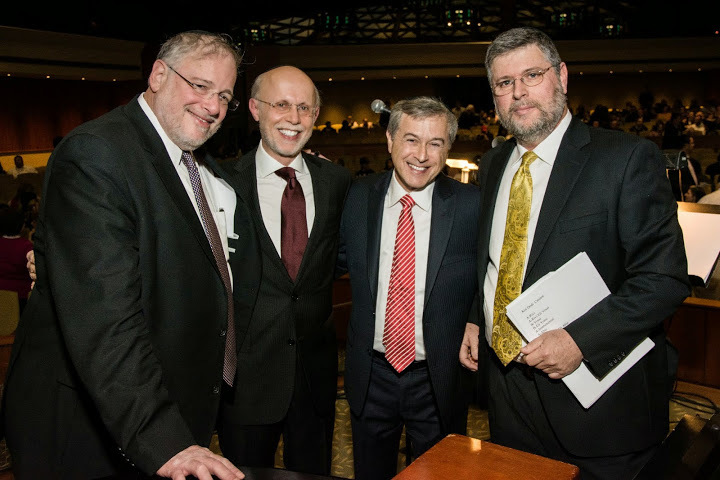 Baltimore, MD – Nov. 25 – The two previous D’veykus concerts at Shomrei Emunah were such a success, that those who planned the 3rdreunion knew they had to make it bigger. The concert committee included: Natan Berry,Kenny Friedman, Avi & Sora Greenlinger,Bonnie Pollak, Stuie Schabes and Chaim Wealcatch. Shomrei gave special tribute toChazan Chaim Gartenhaus for his 25 of years of service as Chazzan for the Yomim Noraim. featuring, Nossi Gross on flute, Alfredo Mojica on percussions, Gerry Kunkel on guitar, Gary Honickon bass, and violinist Yonatan Grinberg. The crowd was given a taste of Dveykus, Journeys and Aish. 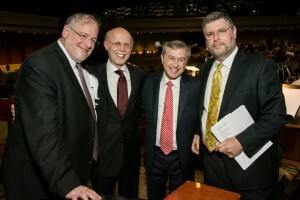 The show began with the night’s MC Dr. Kenny Friedman who introduced the night’s opening singerShlomo Simcha. 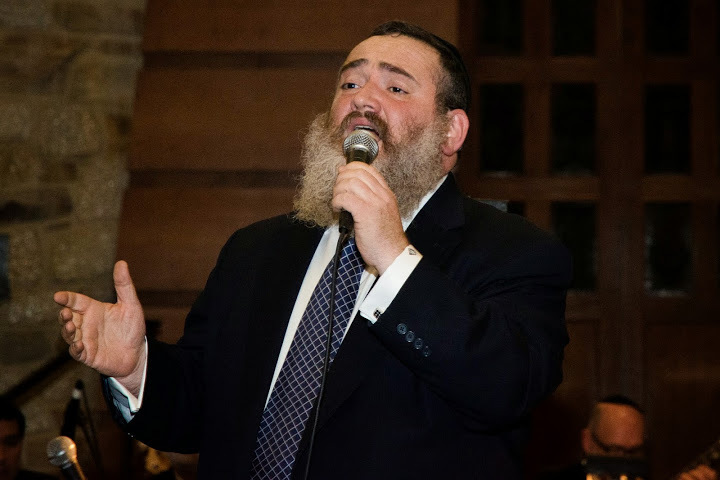 Shlomo dazzled the crowd with his sweet and tremendous range singing R’ Shlomo Carlebach’s Yachad and Moshe V’aharon with a combination of chazanus and song. Abie, Eli, Yussi and Rivi took the stage and wasted no time piercing the neshamos of all those in the crowd singing Kol Dodi, Kol B’rama, Shma Koleinu, and Hinei Anochi. Then in a very special moment, the honoree himself, Chaim Gartenhaus, joined Dveykus in singing one of Shomrei Emunah’s favorites, Ani Maamin. After a heartwarming speech by the honoree, Abie introduced Acheinu. He noted that this song has recently been song by yidden across the world in response to unfortunate tragedies. He asked for the audience to sing along and to pour our neshamos out. 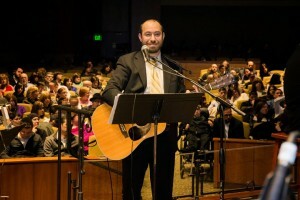 Prior to the intermission, Kenny read a letter written by the Gartenhaus’ children from Colorado, Israel and New York who were unable to attend Sunday night’s event. Rabbi Binyomin Marwick, RAv of Shomrei Emunah, then presented him with a beautiful menorah with a Shamash in the shape of a Shofar which is symbolic of the Yomim Noraim. After the intermission, Abie and Shlomo Simcha opened with a beautiful rendition of “Conversation in the Womb”. As Rivi then joined them on the stage, Shlomo Simcha reflected on the terror in Har Nof of the past week and mentioned that he was taken by the coverage of the shul the day after. The sound of Kol Torah emanated with great fervor and passion and with this, Shlomo and Rivi sang Habeit with every ounce of their hearts. It was then time for more D’veykus. Habein Yakir Li, Proik Yas Anach, Shalom Rav, Lakol Zman Va’Ais and Naar Hayisi. The last songs of the night were V’lirushalayim and R’ Shlomo’s Uvnei with the hope, as Elie Kranzler said, that we can yet again enjoy a safe and secure Yerushalayim. To the concert committee – we can’t wait until they come again!